The Guatemalan collections highlight political developments and social conditions. Several contain materials on the civil war from 1960 to 1996, including one (Burgos-Debray Papers) with extensive documentation on the life of the prominent Indian activist Rigoberta Menchú. The Jean Meadowcroft Papers are in part concerned with US educational assistance to Guatemala. The sound recordings of Rigoberta Menchú that formed the basis of her autobiographical book, I, Rigoberta Menchú: An Indian Woman in Guatemala (London: Verso, 1983), are digitized and available for immediate access at the Hoover Archives. 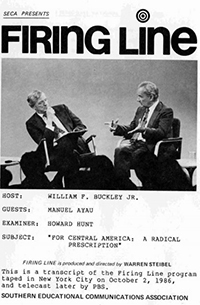 "For Central America: A Radical Prescription"